London has a lot to offer even for the most spoilt foodies: Michelin stars, celebrated chefs, cuisines from all over the world. But just when it seemed there was nothing new left to cook, along comes Alissa Timoshkina of Kino Vino. Simply put, Kino Vino is a combination of a supper club and a film screening, with menus created especially by guest chefs to reflect the fictional world onscreen. You could call it the next Secret Cinema — in which you are invited to experience the atmosphere of film through food. For Timoshkina, food and film have been passions for most of her life. “I have been working with film for a while, and have a PhD in film, and I’ve been cooking and hosting parties for as long as I can remember,” she says. The idea of integrating the two came on a trip to Cape Town during a visit to local vineyards. 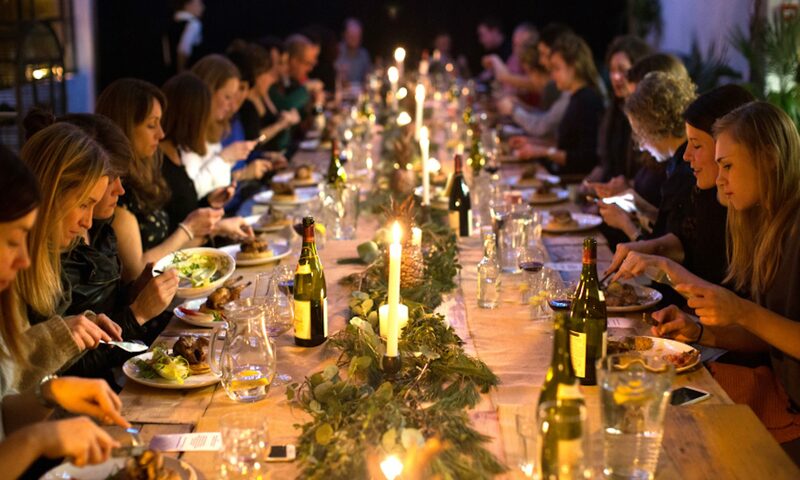 “I was very impressed with how eloquently sommeliers speak about wine and how it pairs with food, and after a few tastings I thought, why not to try and put on an event where wine, film and food would be thematically connected. The name sprung out immediately as in Russian it’s a very cool rhyme”, she recalls. Timoshkina’s first supper club was based on Peter Greenway’s The Cook, the Thief, His Wife & Her Lover: a classic roast dinner with a lot of red wine to reflect the deep and rich colours in the film. The following editions spanned a variety of film genres and countries: Ukraine with Olia Hercules and Soviet witch horror Viy, Greece with Despina Siahuli and classic romcom Shirley Valentine, Georgia with Russian Revels and Tengiz Abuladze’s The Wishing Tree, Oliver Rowe’s take on British food based on Wes Anderson’s Fantastic Mr Fox. Timoshkina admits that in London, oversaturated with restaurants, food events and supper clubs, it could be quite challenging to stand out. “In our post-modern culture you need to have a mix of everything, people are not interested to go and just eat, they go for an experience rather than the food, they want something unique. Keeping up in London is a great challenge because people can get bored very quickly,” she says. “People are not interested to go and just eat, they go for an experience rather than the food” Yet the main concept at the foundation of Kino Vino lies beyond trends and is quite simple: people sharing a unique moment. “What’s important to me is the idea of a gathering, of people coming together, something almost intimate when you watch a film together in a small group of people, laugh together, share food and wine, it’s a nice bonding experience”, Timoshkina says. “To me that’s quite special”. We asked Alissa Timoshkina to come up with menus for some iconic films — both new releases and cult classics.